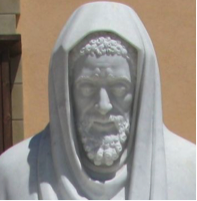 Yehudah HaLevi was a medieval Spanish poet and philosopher who is known by a number of names including the Hebrew Judah Ha-Levi and the Arabic version, Abu al-Ḥasan al-Lawi. It is believed that he was born around the years 1085 or 1086 in Toledo in the southern Castile region. These were turbulent times in that part of Spain with the Christian King Alfonso VI mounting a successful conquest during May 1085. Judah was sent by his father to be educated in the mostly Jewish settlement of Lucena where he could study Jewish history and customs. He demonstrated an early aptitude for poetry, being an avid student of the many Arabic and Castilian poets who had gone before him. Despite this though it seemed that he had originally chosen medicine as a career path. It is likely that this view will have been influenced by an event from earlier in his life when a confederation of North African Berber tribes known as the Almoravids stormed through Andalusia, imposing extreme Muslim control of the whole region. Until this unhappy time he had been living in relative harmony, collaborating with Hebrew poets such as Moses ibn Ezra, a man who would become a lifelong friend. HaLevi was clearly distressed by what he saw, with his countrymen seemingly being crushed between “hammer and anvil” – the Christians and the Muslims fighting each other but slaying Jews at the same time, almost as an afterthought to their main aspirations. There seemed to be no future for his people, and this hopelessness manifested itself in many of his poems. Eventually he set out on his great journey, traversing the Mediterranean and then landing in the Egyptian port of Alexandria. From there he planned to go on foot towards his final destination. He had planned this journey for many years and he left Spain in 1140. Even on the journey he continued to write, mostly sea songs, until he finally landed in Egypt on the 3rd May 1140. His reputation as a great poet and philosopher preceded him and he was well received there and put up in the splendid home of a Jewish judge and physician. After a stay of several months he moved on to Cairo, a place then known as Fustat. More acclaim awaited him there and his faith in human nature and the world seemed to be restored. Records suggest that he never left Egypt and that he died there. Legends, however, suggest that he did reach the fabled land of Zion and was slain by a hostile Muslim as he was about to complete his arduous journey. Whatever the truth of the circumstances surrounding his death, it is believed that he died sometime during the month of July 1141. His age would probably have been around 55 or 56.